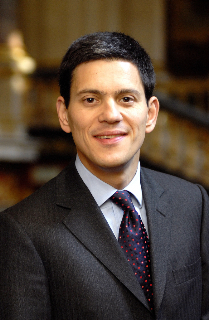 David Miliband is a British politician, public policy analyst, and charity chief executive. A member of the Labour Party, he served as an MP for South Shields, from 7 June, 2001 to 15 April, 2013, and Secretary of State for Foreign and Commonwealth Affairs, from 28 June, 2007 to 11 May, 2010, among other duties. His brother is politician Ed Miliband, who led the Labour Party from 2010 to 2015, after winning a close race for party leader against David. His father, Ralph Miliband, was a famous Belgian-born Marxist academic of Polish Jewish origin who fled with his parents to England during World War II. His mother, Marion Kozak, a human rights campaigner and early CND member, is a Polish Jew who survived the Holocaust, being protected by non-Jewish Poles. David is married to professional violinist Louise Shackelton, with whom he has two children. His middle name, Wright, is after American sociologist C. Wright Mills, who was a friend of David’s father. David’s paternal grandparents were Samuel Miliband (the son of Zyndel Gershon Mileband and Chana Leah Auslender) and Renia/Renée Steinlauf. Zyndel was the son of Abram Moise Miliband and Esther Tempeldiner. Chana was the daughter of Abraham Ytszak Auslender and Rebecca Rachel Fiszman. David’s maternal grandfather was Dawid Kozak (the son of Mosek Mauryc Kozak and Ulda Adela Hercberg). Dawid was born in Częstochowa, Poland, and died in Harzungen, Germany, in 1945; he was murdered in the Holocaust. Mosek was born in Częstochowa, the son of Abram Kozak and Cyrla Laja Kopinska. Ulda was born in Żarki, Poland, the daughter of Dawid Hercberg and Estera Szyjowicz. David’s maternal grandmother was Bronislawa/Bronia Brucha Landau (the daughter of Dawid Herszlik Landau and Doba/Dobra Entla Gitla Kromolowska). Bronislawa was born in Przyrów, Poland. Dawid was the son of Mortka Landau and Rajzla. Doba was born in Koniecpol, the daughter of Jochim Lewek Kromolowski and Liba Rajzla Frid. “David Miliband 2” by Foreign and Commonwealth Office – http://www.whatdotheyknow.com/request/photographs_of_ministers_45. Licensed under OGL via Wikimedia Commons. i swear there are plenty of English Jews who look not typical English and i had to look up and had the proof that i was right ! lol because Ashkenazi or Sephardi Jewish is an actual ethnicity. In this site there a considerable number of actors/entartainers of 100% Ashkenazi descent who could easily be British.